This past weekend we were lucky enough to be invited up to Smith Mountain Lake to the Sowell’s lake house. This was the first time for most of the family to ever visit there. Mom was the only one that had visited in the past. 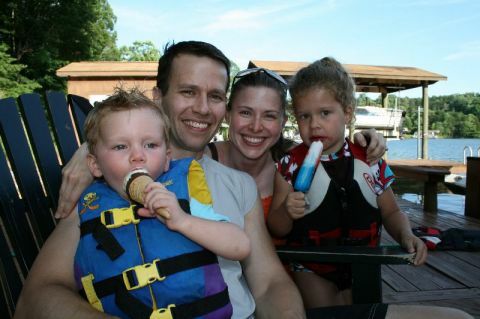 So to get out on the lake in a boat was a new adventure for Mara and Campbell. They absolutely loved it. There was a lot of riding on the boat. Lots of swimming in the lake. And some riding in the tube. And the weekend also meant that there was some yummy food to eat like ice cream. The lake has an ice cream boat! Just like the truck that comes to your neighborhood, only on the water. Who would have thought? All my children… I mean two only. The fam on the dock. The other fam in the boat and on the dock.